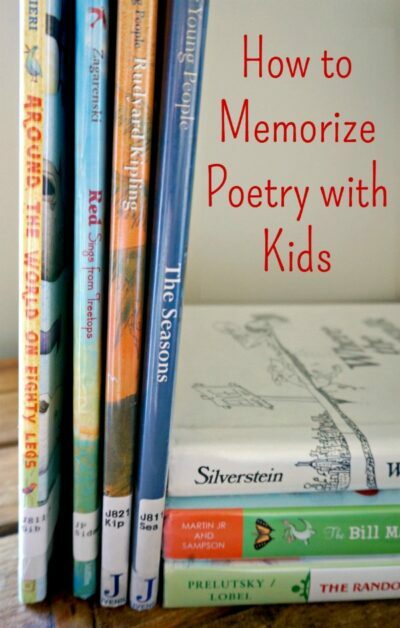 If you had told me a year ago that I would be writing a blog post about how to memorize poetry with your kids, I would have laughed. A lot. Not because I disliked poetry. I still have fond memories of my dad reading Robert Louis Stevenson’s “The Swing” and Henry Wadsworth Longfellow’s “Paul Revere’s Ride” when I was a child. And my husband basically won my heart when he gave me a few original poems proclaiming his undying love (or something like that). But with my own children, poetry seemed both vague and daunting. I could handle it if it was a story told in verse, but I honestly didn’t know what to do with a poetry collection. What interest would they have in a bunch of seemingly disconnected poems? Something gave me a gentle nudge (Erica’s poetry challenge from last year; a podcast episode about memorizing Shakespeare; a presentation about Shel Silverstein in my son’s first grade class), and I thought, Hmmmm. 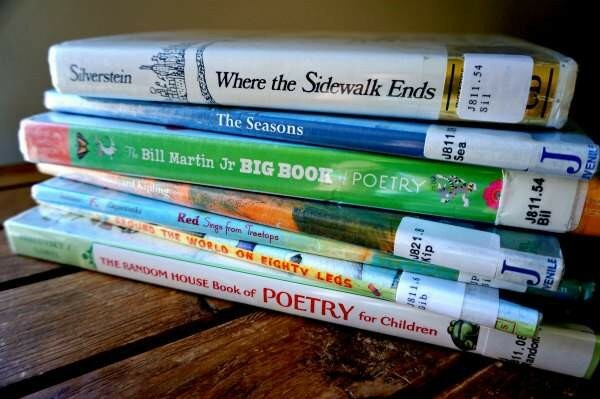 Would my kids enjoy listening to poetry? Would they enjoy memorizing it? Would I enjoy it, too? The answer, as it turned out, was a resounding yes. But first the question, How do you read poetry with young children? The answer is far simpler than I could have imagined and follows this simple cycle: flip, choose, read; my kids flip through the pages, they choose a poem, I read it to them. Jumping around like that actually helps them grasp the idea that a poem is a self-contained work and not necessarily connected in any way with what we read before or what we’ll read after. Each poem is different and unique. Some are short, some are long; some rhyme, some do not; some follow a predictable meter, others are more free flowing; and they can be funny, instructive, serious, silly, or contemplative. If you are singing to your child, then you are already introducing him/her to the wonderful world of poetry. Lyrics have a natural cadence and rhythm that children love, and being paired with a melody makes it easier for kids to memorize them. The very first poem we officially learned was “Spaghetti, Spaghetti” by Shel Silverstein. I chose it because it was short and descriptive. But mostly, I chose it because it was funny. None of my kids can say the last line without cracking up. In order to be loved, a poem doesn’t have to be funny. However, it does have to strike the right chord. 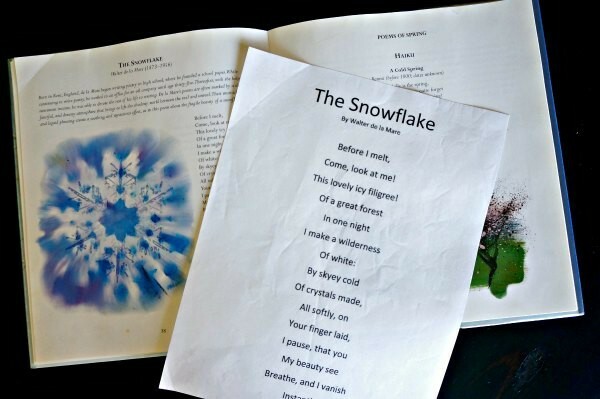 More than other genres, poetry is all about connecting to the words on an emotional level. You’ll be able to tell within a few repetitions if it hits its mark or not. And if it doesn’t, it’s not a big deal. Just choose something else. The perfect poem might not be in that Best-Loved Children’s Poems anthology. Many picture books are told in verse, so you might just want to pick a few stanzas from your favorite story (or tackle the entire thing, if you’re ambitious) and memorize that. Songs, as mentioned above, are another great source of poetry. Or we’ve also found some great poems tucked within a longer story (I’ve long been tempted to have my kids memorize the Oompa-Loompa’s song about the dangers of TV in Charlie and the Chocolate Factory). 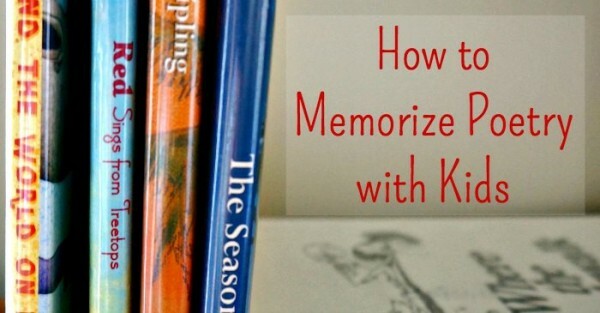 Once you’ve chosen what you want to memorize, write it up and post it in a visible place. For us, that’s on the wall right next to the kitchen table. This might be the biggest key to actually learning it. Because it’s right there, you’ll remember to practice it. Also, it’s great for kids who can read because without even realizing it, they’ll read through it a few times while eating their breakfast. And finally, it’s extremely helpful for you as a parent because it’s easy to slip a glance at it if you forget a word when you’re saying it for your kids. Here’s our routine for learning a poem: I recite the entire poem as expressively as possible. Then we break it down to just a couple of lines. I say the small segment three times in a row, inviting them to join in with me and try it. It doesn’t matter if they get all the words or not. Then I ask, “Would anyone like to try it alone?” Sometimes someone wants to and sometimes not, but that’s usually the end of our practice for that moment. Later in the day (or the next day), we try again, following basically the same steps. I could have included this with the tip above, but I think it deserves its own special space. For younger kids especially, it is extremely helpful for them to have a way to anchor the words in their memory, and using their hands is a perfect way to do it. It really doesn’t matter whether or not you find the perfect way to show “swing” or “running” or “night,” so long as you are consistent and use the same gesture every time. In the space of just a few months, poetry has become an important part of our family culture. It does my heart good to hear my boys ask for “just one more” or to hear their little voices recite these time-tested words. Does your family have a favorite poem? I’d love to hear about it! Those books are some great sources for unlikely poetry! I love your blog. 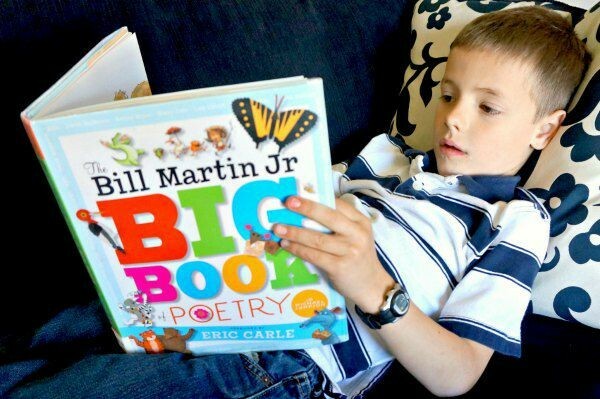 This is a very inspiring article that has shifted my mindset to include more poetry with our family reading goals. Thanks so much for sharing this. Oh good! I hope it opens the door to many fun moments with your family! Oooh, I’ll have to check that one out! Thanks for the suggestion! Thanks for this list! I’ll have to see if my daughter has any of these in her class library at Girls Prep. We read poems from Where the Sidewalk Ends on a regular basis, but I’m excited to see what the other books are like. We’re huge Shel Silverstein fans (my 21 year-old won’t part with her books), but we also like Ken Nesbitt. Definitely worth checking out. Thanks for the suggestion! I’ve not read Nesbitt, yet! Thanks for these suggestions! We love Jack Prelutsky, especially for young kids. A few favorite poetry collections (Prelutsky and otherwise): The Random House Book of Poetry for Children; A Child’s Book of Poems (Fujikawa); Poems and Prayers for the Very Young; and A.A. Milne’s books When We Were Very Young and Now We Are Six; Sing a Song of Popcorn. I love the illustrations that come with the poetry for young people series. It leads to a discussion on what poetry invokes. This find has perfect timing as my son is about to turn 7 and has ‘asked’ for poetry books for his birthday! No idea where this idea came from, but I’m embracing it and so proud this was his own idea. A great list if books for us to choose from. Thank you. I love that! Embrace poetry! This is great – thanks. We’ve been learning poetry in our house. We just finished I Wandered Lonely as a Cloud, by Wordsworth. It’s started to be less fun than for them lately, so this will help change it up a bit. … It was also fun to find your post because I, too, am an Amy with four active young boys!